Home / Unlabelled / Check Out Krispy Kreme’s Chocolate Transformation! Check Out Krispy Kreme’s Chocolate Transformation! A chocolatey change comes to Krispy Kreme as it introduces three new, mouth-watering variants: Chocolate Glazed, Chocolate Glazed with Sprinkles and Double Chocolate Cake all available from January 6, 2018, up to a limited time only. On a mission to create the perfect Krispy Kreme doughnut experience for its customers, the home of world-famous doughnuts and coffee transforms the glaze curtains of its doughnut machines into rich, velvety chocolate curtains, creating that incredible chocolate moment for every chocoholic who will stop by its factory stores. To make things even better, Krispy Kreme shares the fun by serving hot, fresh Chocolate Glazed Doughnuts starting January 6, 2017! When the Hot Light turns on at Krispy Kreme’s factory stores in Bonifacio High Street, SM Mall of Asia, Evia Life Center Las Piñas, Greenhills Shopping Center, IT Park Cebu, Limketkai Center Cagayan De Oro, SM Bacolod, SM Baguio, and SM Ecoland Davao from 6PM-7PM daily, customers can get Chocolate Glazed Doughnuts fresh from the luscious chocolate curtain, for free! 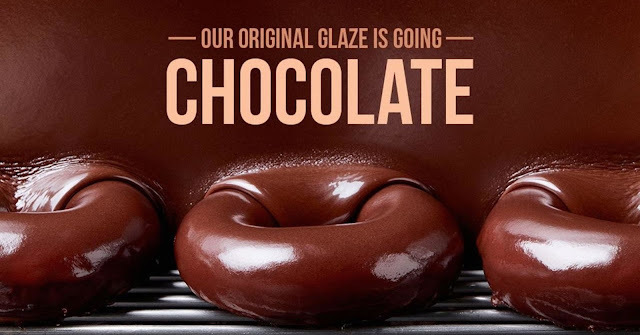 Take a joyful bite of Krispy Kreme’s chocolate transformation! Priced at PHP48 each and PHP430 for a dozen, munch on a sweet, velvety Chocolate Glazed Doughnut, the classic you love turned into a chocolate ring doughnut and made even better with a smooth chocolate glaze. Feeling a bit more playful? Indulge in a Chocolate Glazed with Sprinkles and savor the creamy, rich chocolate doughnut topped with chocolate sprinkles for that added crunch. For those craving for a more serious chocolate fix, there’s the Chocolate Double Cake, a rich and moist cake doused in a chocolate glaze that will give you chocolatey goodness in every bite. Krispy Kreme is an international retailer of premium-quality treats, including its signature Original Glazed ® doughnut. With a flagship store in Bonifacio High Street in Bonifacio Global City in Taguig, the company has offered the highest-quality doughnuts and great-tasting coffee in the country since 2006. Today, Krispy Kreme has outlets in more than 70 different locations nationwide. To get more information and updates about the brand and its products, you may become a Friend of Krispy Kreme by visiting www.krispykreme.com.ph or through our social media accounts.